In three previous posts we have dealt with different stages of the 23 November display that had some interesting features, like an anomalous Hastings/Wegener arc and a possible 4th Tape arc. Here we show the rest of the material we got that night. 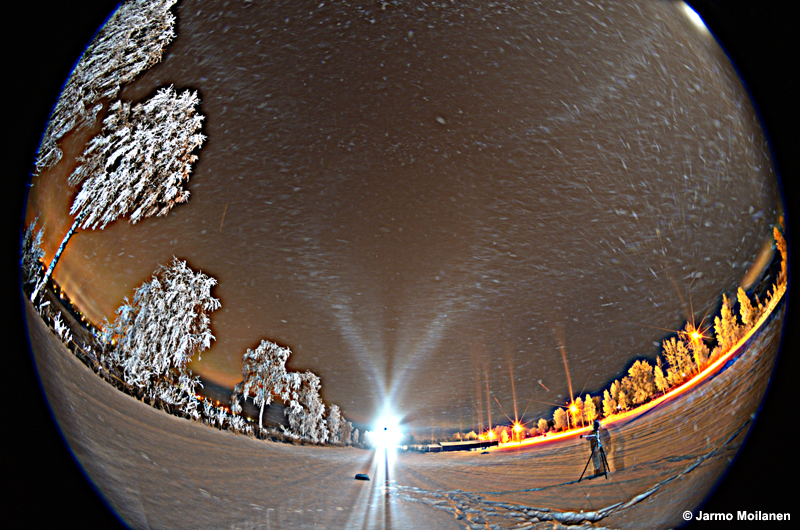 After the lunar display was gone, wind direction changed and we followed the diamond dust to a new location. As usual, there is only one place to choose from when temperatures are not very low and the new field we found ourselves in was less optimal than the earlier one, having a rather confined space and yellow streetlights nearby. But you photograph where you can. 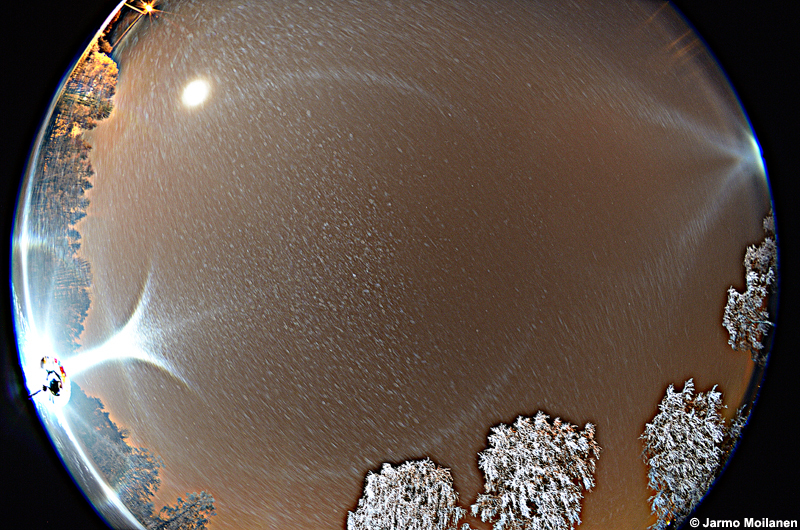 The image above and two below show that it was overcast again, moon glowing weakly through the cloud. In the beam, the display was not nearly as good as it had been before, yet it was by no means poor – it is only because we had been just a bit earlier spoiled by a monstrous halo complex we didn’t feel that inspired anymore. Add to that the ever more demanding calls of the land of slumber (we had been up most of the previous night and not sleeping in the daytime either because halos wouldn’t let us), we packed it all up and headed for the caressing warmth of the indoors even though the display was still kicking on. Lamp elevation is around 0 degrees in the three photos above. Who knows what there would have been on the offing after we gave up, there was still plenty of night left. As were about to doze off, the stratus clouds started breaking and moon shining bright again. Any change in conditions means also change in halos, and this one may have been for the better, judging from earlier breaking of clouds which produced a major spectacle. In the image gallery at the bottom there are also photos from the first action of the night, soon after it was dark. Crystals were collected and there were plenty of plates with internal structures. 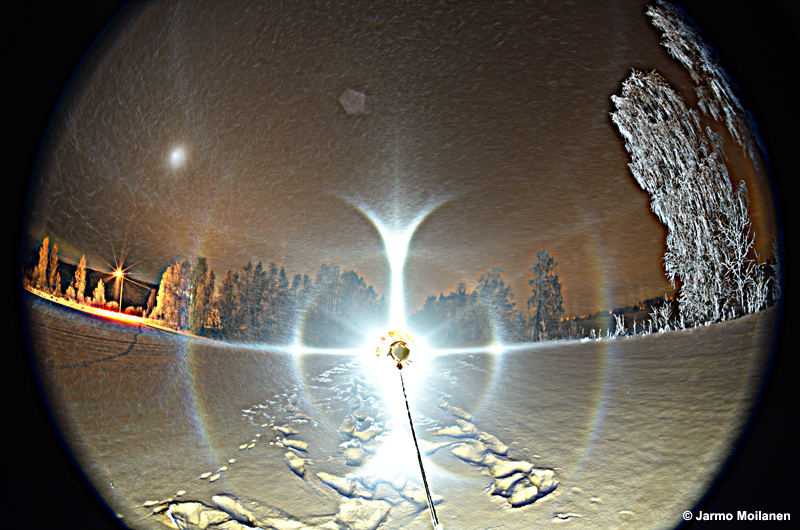 This entry was posted in artificial light source halos, diamond dust halos, ice crystals, reflection halos. Bookmark the permalink.